The price quoted above is monthly and at least 3 months must be purchased! Makaio "The Mak of Jazz"
If you're seeking a complete Rat Pack ensemble who can travel anywhere in the U.S. we recommend Jazz Vocalist Dr. Michael Matone Baglino. While based in Palm Beach County he has performed on Long Island, NYC, Minnesota and elsewhere. 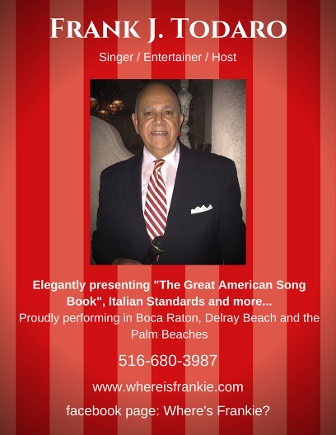 For a great lounge singer with one of the best voices around we recommend Tony Martelli who performs both in South Florida and Boston. If its a cantor and opera singer you're after Stephen Texon is top knotch! If you know of any crooners in Florida who would be worth putting in our directory please contact us!